Stawamus Park. Out of the Ordinary. "Love doesn't make the world go round. Love is what makes the ride worthwhile." The Chief’s three summits offer spectacular views of Howe Sound, Squamish town site and surrounding mountains. This park has opportunities for picnicking, camping, hiking, rock climbing and scenic viewing atop the Chief. 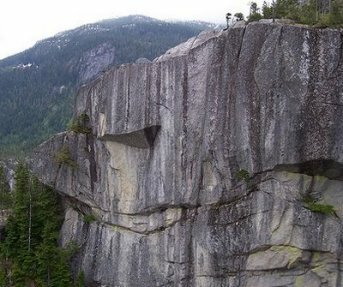 The Stawamus Chief is the second largest granite monolith in the world and provides good nesting habitat for the Peregrine Falcon. Please respect the wildlife and keep your distance. Viewing is best with a pair of binoculars or other viewing aide but please keep your distance. Climbers are asked to obey posted closures of climbing routes on the Chief from March to July, during the critical nesting season of the Peregrine Falcon. This park offers several vehicle accessible campsites on a first-come, first-served basis. Please note that campsite reservations are not accepted. Vehicle sites are small are not suitable for large RVs. The remaining sites are walk-in sites. There are 63 sites in total. Sites are very shaded with mature second-growth coniferous trees. There is parking for extra vehicles in the day-use parking lot, available for a fee. The gate is locked between the hours of 11pm and 7 am, and during the winter season. Walk-in camping is available when the gate is locked. If there are no staff on hand to direct you to a site, find an unoccupied one not occupied by equipment or a valid camping permit. Campground fees are to be paid in cash at the entrance of the campground through a self registration envelope system. The nearest store is in Squamish approximately a 5 minute drive north on Highway 99. There is a pay phone located next to the information kiosk. There are storage lockers located next to the cooking shelter. No campfires are permitted. Setting up of slack lines is prohibited within the park. Campsites in Stawamus Park are small and overcrowding is not permitted. This park has winter camping; however, the gates are locked in the winter, so camping is walk-in only and no services are provided. The 47 sites are less than a 5 minute walk from the parking lot. The tent pads are raised gravel pads with a wooden border. Tent pads are small and overcrowding is not permitted. Sprawling of gear and camping equipment off of tent pads is prohibited thus ensuring vegetation is not damaged. A central cooking shelter is available however park visitors must bring their own cook stove. Campsites are extremely shaded with large mature coniferous trees. Please store all food in the storage lockers located throughout the campground and in the cooking shelter as bears live here in the area. This park also has a day-use/picnic area. There are pit toilets and one (1) covered shelter available. There are no barbeque attachments on the picnic tables. The gate is locked from 11pm to 7am. The day use area located within the highway pull out is provided with picnic tables, information kiosk and pit toilets. This area provides an excellent vantage for watching climbers and viewing the Peregrine Falcons. There is another day use area located adjacent to the campground with picnic tables and offers a spectacular of Squamish and Howe Sound. Water taps are located at the Stawamus Park entrance. Pit toilets are located at the day use and campground areas. Hiking trails are accessed from the day-use parking area near the campground. They follow Oleson Creek before dividing into separate trails to each peak. The trails are also accessible from Shannon Falls Provincial Park. Be properly prepared for a strenuous uphill hike and changing weather. 1.5 kilometer trail with an elevation gain of 500 meters. 1.7-kilometre trail with an elevation gain of 700 meters. 1.8-kilometre trail with an elevation gain of 750 meters. 1.5-kilometre hike from the Stawamus Parking Lot. Pets must be on a leash at all times except on the chief Peaks Trail. Backcountry areas are not suitable for pets due to wildlife issues and the fact that bears live here. Climbers from all over the world come here to climb the Stawamus Chief. Climbers must note: climbing closures are in effect from March 15 until July 31 during the Peregrine Falcon nesting period. Closure times may vary from year to year. Feel free to link to our site. Copy this code into your site. mountain area. Two hour drive from Vancouver. Skiing, snowboarding, river rafting, kayaking, hiking. 2010 Vancouver Olympic games venue for Alpine, Nordic and biathlon skiing. Bobsled and Luge racing. Two million visitors yearly go home tired and happy.